"It's John Mathis, how are you doing?" 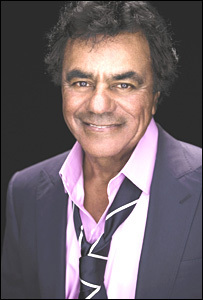 For a man who is said to be one of US music's shyest performers, Johnny Mathis is sounding on good form on the phone from Los Angeles. 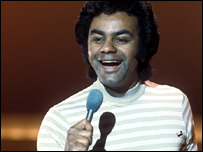 Mathis is best known in the UK for his 1976 Christmas number one When A Child Is Born. But he has produced scores of albums since he was discovered, aged 19, singing in a San Francisco club. An accomplished high-jumper, the young Mathis abandoned his plans to join the 1956 US Olympic team, and armed with his trademark velvet smooth voice, he never looked back. That voice is as strong as ever on his latest album, A Night To Remember, a collection of romantic standards which also features collaborations with Gladys Knight and saxophonist Kenny G. It gave the 72-year-old a chance to roll back the years. "Almost all of these recordings are songs I listened to when I was younger," Mathis explains. Asked if there is a performer he still dreams of working with, it is clear the idols of Mathis's early career still shine brightly in his life. "Not too long ago I realised my great dream of singing with Lena Horne, who was a big icon when I was growing up," he says. "She's a great lady of the theatre and one of my favourite entertainers. It was a big thrill for me. "Now with all the technical stuff they have going, it's not impossible for me to one day sing with my great vocal hero, Nat King Cole." Of newer performers, he talks of the fun he had performing album track Always with California jazz singer Mone't, and praises Alicia Keys - "a wonderful artist who writes her own music and does a great job". But he laughs when the name of another new performer escapes him. "You know, I've been playing golf so much lately, I haven't been listening to the new crop of singers," he admits. "I used to do it religiously, that's the way I started my day - but I don't do it as often as I used to so I'm not so updated." Mathis brightens as he talks about his golf. The sport has long been a passion for him, and in the 1980s he even held his own tournament. His golfing buddies include a host of athletes and rocker Alice Cooper. "It's very personal, very spiritual," he says. "It's a wonderful game, you can play it by yourself, you can play it until you die, and the handicap system makes it possible for me to play with better golfers and it's a way of getting outside and seeing really beautiful landscapes." As for his handicap - "well, it goes up, and it goes down," he laughs. "I was doing very well for a time with a friend of mine who was on the Asian golf tour - he and his wife are big fans of mine, he was helping me out for a bit and he got me down to a seven handicap. "Then he and his wife moved away and I was on my own, and I'm back up to reality now with a 12 handicap." While his high-jumping days are long behind him, Mathis still keeps up with sport. "I'm a big fan of basketball at college level and professional, I even watch international soccer," he says. "I don't really have a team. I'm more a fan of the individual athletes. "I just bought a soccer shirt in the Brazilian colours. I used to go to Brazil quite often and got to know a lot of the players." Mathis still performs and has a series of US shows lined up throughout 2008 - and is hoping to return to the UK soon. But what of the popularity of When A Child Is Born with British fans? "What is popular in the States is nothing to do with what eventually becomes popular in Great Britain," he says. "For years I'd marvel at the fact that when I prepared for concert tours in Great Britain, some of the songs on the set list I didn't even remember recording so I had to brush up on them! "So they're completely different from what I've been singing over here. It's refreshing, it keeps me on my toes, and I'm really looking forward to it. I hope that this tour comes around soon." A Night To Remember is out now on Sony BMG.